A smart phone combined with a solid photo app can work great for fully automated images, but soon you will want a setup with an individual camera body and lenses. Not just for flexibility, but for better image quality. The best beginner cameras can feel somewhat like their higher end counterparts, but with a simpler feature set, allowing you to progress up to more advanced controls. Here will go through some likely camera models which can be a stepping stone into the DSLR market and help you understand what all this shutter speed, aperture, ISO, exposure compensation stuff is all about. All the cameras mentioned below are worthy contenders as a first DSLR and in many ways your choice may come down to simply budget and which you can pick up for the best price. Over the years, many people got their feet wet for the first time into the DSLR world with the Canon Rebel range. This compact DSLR has the body design and feel of a large DSLR, with smaller proportions and a simpler to navigate feature set. The latest version has a 24MP Dual Pixel CMOS sensor coupled with a Digic 7 processor. The body design may be small, but it’s still comfortable enough to grip. The addition of a touchscreen LCD which can move and rotate 270 degrees is something every camera body should possess. Transferring your images is also made easier with Bluetooth and Wi-Fi, along with a ‘Feature Assistant’ to help you around the camera settings. The autofocus system is quite basic, with only nine points, and doesn’t do the best tracking of moving subjects. But when you flip to Live View, The Dual Pixel AF system tracking becomes much more efficient. Canon is known for their good JPEG colors which stand out on this camera but can be a little soft at times. Cameras like the Rebel usually give you your first forays into Raw file processing, just don’t expect ultra-dynamic range. Video is a respectable 1080p and using the touchscreen makes focusing that much easier. There are not many advanced controls apart from audio levels exposure and auto ISO, but the idea with this camera is to get your toes wet into the world of DSLR. The Rebel SL2 is a great starting point and a good all-rounder, just don’t expect too many advanced features. 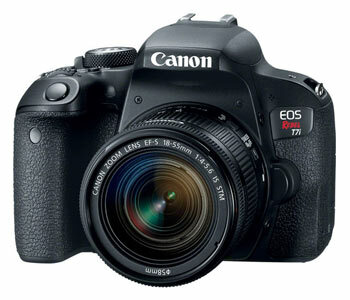 Another contender from the Canon Rebel line is the EOS Rebel T7/2000D. An upgrade from the T6, it has more up-to-date features like a 24MP sensor and Wi-Fi, but no Feature Assistant. External controls are basic, which can be great for a beginner but also means you can quickly outgrow them. It’s a shame the rear LCD screen is fixed and there is no touch control. 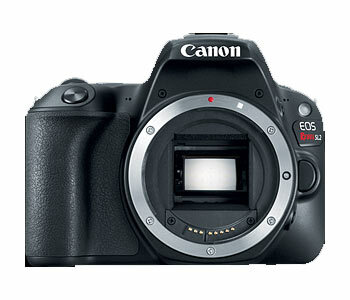 You will get a nine-point AF system, which is quite basic by today’s standards and gets quite slow in low light and in live view, but it allows you to start to delve into the way Canon design their DSLRs. Battery life is also pretty good at 500 shots per charge. Video footage comes out at 1080/30p with reasonable quality, but can only use single point AF. 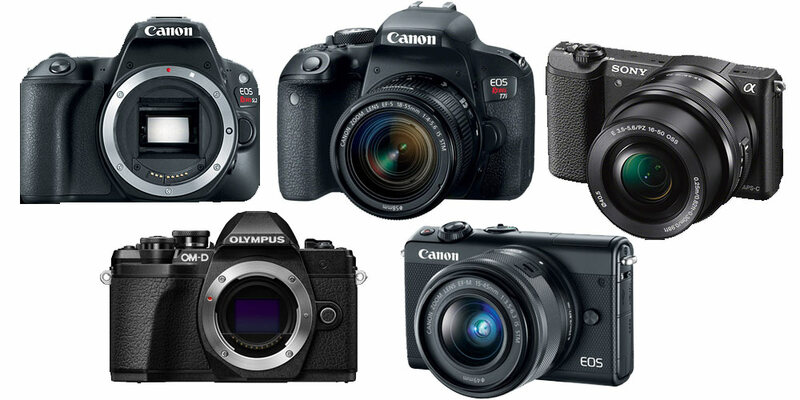 In many ways, entry-level mirrorless designs offer far more video capabilities at the entry-level. One of the reasons why the Rebel line is popular is that JPEGs straight out-of-the-box are very pleasing, with nicely saturated colors. Raw files can’t be pushed a lot, especially with shadows, so this camera likes more ideal lighting conditions. Overall, a good all-rounder which focuses more on the stills side of things rather than video and a great starting point into the DLSR world. 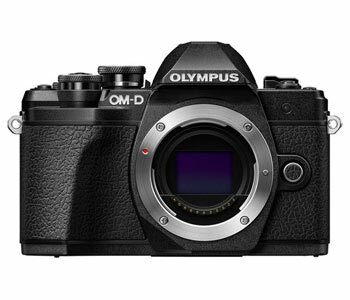 The Olympus OM-D E-M10 III is competitively priced and has some more up-to-date features that you would find on the Canons above. It may have less resolution at 16 MP, but it comes in a more lightweight package being a Micro Four Thirds mirrorless format and can shoot 4K video. The external controls feel more like a fully fledged camera with two control dials and customizable buttons. Cameras at this end of the market have stripped down menus from their higher end brethren and just like the Canon, an ‘Advanced Photography’ menu for easy access to more advanced features. The autofocusing works well for single images but starts to struggle in burst mode. The touchscreen helps you focus, especially with video and the JPEG engine does a good job of rendering. Raw files come out reasonably well, without too much noise, especially in the shadows. In-body stabilization works well with 4K footage, but the focusing is best left on manual. 4K video quality is very good, with well-saturated colors, but there are not many advanced ways to tweak your settings and there’s no Mic socket. However, the camera is a great all-rounder if you specialize in swapping between stills and video on a regular basis. As mirrorless designs seem are the way things are going, the camera can also be the first steps down this road, rather than a traditional mirrored DLSR. 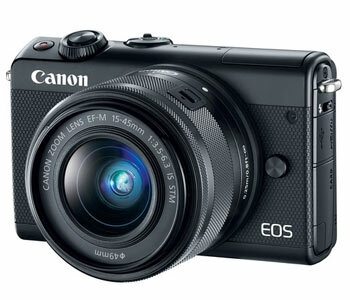 The EOS M100 is small and very lightweight, using the tried and tested Canon 24MP APS-C sensor, a flip-up touchscreen and Dual Pixel autofocus system. Being such a small body, there’s not much room for physical controls and most things are done via the rear screen. The Dual Pixel autofocus system tracks moving subjects reasonably well and doing this by the rear touchscreen makes focusing easy, especially with video. 6.1 fps is reasonable for this level of camera, with battery life lasting around 295 shots. As the 24MP APS-C sensor is similar to other Canon models, JPEGs are very similar in quality and Raw files have quite low noise, but not an amazing amount of dynamic range. Just like the other Canon offerings, there’s no 4K video, but you can at least adjust audio levels, auto ISO in manual mode and exposure compensation. You can get great images from this camera and as these types usually come bundled with a kit lens, you can start shooting straight away. Being so fun and compact, you’re more likely to get a bit more creative with this model. Sony has definitely been kicking the other brands when it comes to mirrorless design functionality. This has filtered down into the more entry-level models such as the a5100 which has a 24.3MP APS-C sensor, a tilting touchscreen, fast autofocus, and Wi-Fi. The controls are very basic with everything done via the touchscreen. The touch-sensitive LCD can also be flipped 180° for selfies. The controls themselves may be a little basic for some, but the camera is aimed at being more of a point-and-shoot than anything else. However, with 179 on-sensor phase detect points, subject tracking works extremely well and feels like a system from a more expensive model. Images come out extremely well for both JPEG’s and Raw files, with the video footage at 1080p/60. 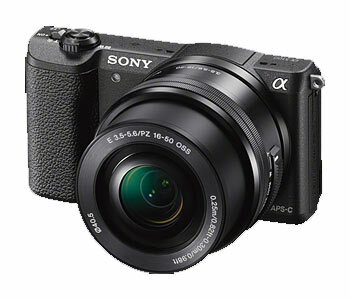 As an extremely compact camera with some advanced features, you can’t go wrong with the a5100.